Dr. Fran Nolan received a Special Merit Award from the Competition. 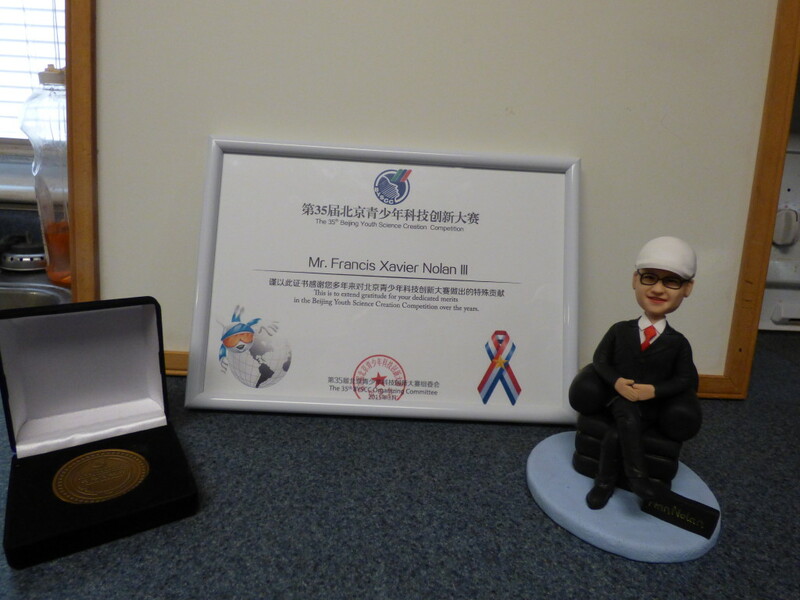 The award came with a clay sculpture of Dr. Nolan, complete with ball cap. Dr. Nolan, formerly the executive director of the Grassroots Museum Collaborative, helped establish the partnership with the Beijing Association of Science and Technology a decade ago. Since 2006, he has attended each BeijingYouth Science Creation Competition along with his wife, Robin Bergeron-Nolan, a health educator with Guilford County Schools. Fran and Robin oversee the logistics for the trip and ensure that all goes well. It is his dedication to this partnership that has enabled North Carolina students and educators a glimpse into science education in China.